Car in limp mode, engine and/or DPF light on, car always regenerating and smoking or using lots more fuel than before? Then you could need the DPF to be removed from the vehicle solving all your problems in one go. You will not need to visit the dealership and pay again and again for the DPF to be force regenerated or pay over �1,000 for a new DPF to be fitted. Removing the DPF will also increase your mpg as the exhaust gas flow is not restricted and your vehicle will still pass all mot emissions tests. Generally removed/blanked off in race or track car to enhance the performance of the vehicle when you do this it can put the car into limp mode or put the engine management light on the dash. We can remove the software from the ECU to eliminate this problem for ever. We can remove the top speed limiter on your vehicle so you can get the full potential out of it on the track. 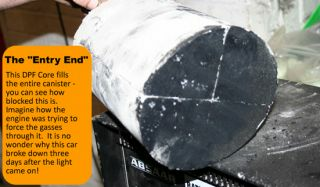 We can also carry out DPF regeneration's to attempt to unblock DPF systems .